RNH1 is present in ribosomal fraction and binds to small ribosomal subunit. (A) Western blot analysis of RNH1 and RPs in polysome-enriched pellet (P100) and the postpolysomal supernatant (S100) fraction prepared from K562 cytoplasmic extracts. Blots are representative of 3 independent experiments. (B) Western blot analysis of the distribution of RNH1 and RPs in sucrose gradient polysome profile fractions prepared from K562 cell lysates. Blots are representative of 3 independent experiments. (C) Polysome-enriched fractions were treated with high salt (0.5 M KCl). Distribution of RNH1 and RPs was analyzed by Western blot in sucrose gradient polysome profiles. Blots are representative of 3 independent experiments. (D) Polysome-enriched fractions were dissociated to 40S and 60S ribosomal subunits with puromycin. 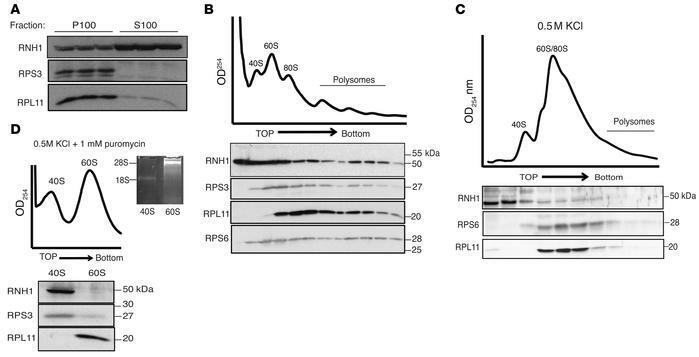 The distribution of RNH1 and RPs in pooled fractions was analyzed by Western blot in sucrose gradient polysome profiles. Blots are representative of 3 independent experiments. 18S and 28S rRNA from pooled 40S and 60S fractions were analyzed to check the purity of the 40S and 60S subunits, respectively.